FILE-In this Wednesday, Oct. 24, 2018 file photo, media, at left, record people entering the KC Mart in Simpsonville, S.C., after it was announced the winning Mega Millions lottery ticket was purchased at the store. The mystery is over. Partly. Lottery officials on Monday announced that a South Carolina resident had stepped forward to claim the $1.5 billion Mega Millions jackpot from last October — the largest jackpot payout to a single winner in U.S. history — but elected to remain anonymous. A lottery commission statement said the person submitting the claim for what was the second-largest lottery in U.S. history has chosen the cash option, a one-time payment of nearly $878,000,000. The biggest jackpot in U.S. history — a $1.585 billion Powerball prize won on Jan. 13, 2016 — was split between buyers in three states. That jackpot also had some mystery as the California winners didn't come forward until about six months later. "We are delighted that the winner is a South Carolinian and has come forward to claim this remarkable prize," said Hogan Brown, the Commission's Executive Director. "We respect the winner's decision to remain anonymous, and we will honor the winner's wishes." The commission said the winner "marvels at how every decision made that day brought the winner to the store, at that very moment" to buy the winning ticket. The winner allowed a fellow customer to make a Mega Millions lottery ticket purchase in front of the winner while in line at the store, the commission said. "A simple act of kindness led to an amazing outcome," the statement said. South Carolina is one of a handful of states where winners can remain anonymous — a choice that winners often make to protect themselves from being targeted by criminals or unscrupulous people seeking money. 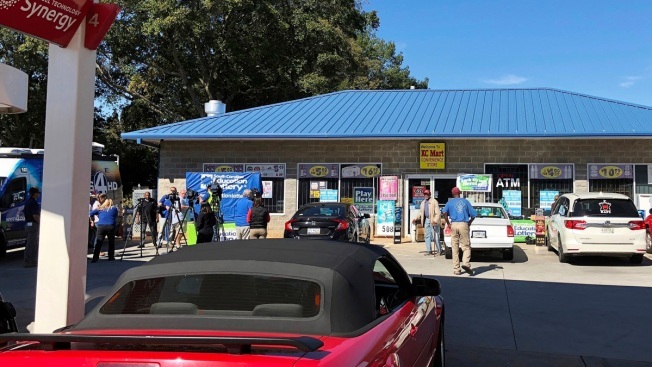 The winning ticket was sold between Oct. 20 and Oct. 23 of last year at the KC Mart convenience store in Simpsonville, a suburb of the South Carolina city of Greenville. "It's exciting. Good for me, good for him, her, whoever it is," said Chirag Patel, owner of the convenience store. That's because Patel gets a $50,000 payment for selling the winning ticket — something he wouldn't have gotten if the prize went unclaimed. Patel said he'll use the money to pay for renovations to the store in Simpsonville as well as some of the six other convenience stores he owns. When asked why he thinks the winner took so long to come forward, Patel said: "That's a lot of money to manage." For months, South Carolina residents had speculated on why the winner hadn't stepped forward. Some theorized that the winner was on the run from police and feared a background check if he or she won. Some thought the winner was so overwhelmed at seeing the winning numbers pop up that he or she died on the spot. Others speculated that the winning ticket had been purchased by an office pool and was now the subject of litigation. The winner had until April 19 to claim the prize. If it had gone unclaimed, the money would have gone back to the 44 states where the tickets were purchased. The statement Monday gave no clue as to why the winner took his or her time to come forward. The prize being claimed does come with other benefits for the state besides the cachet of knowing a new multimillionaire is walking around somewhere. The lottery commission said the state will get $61 million in income taxes from the winner. And that could get passed along to taxpayers if a proposal goes through to give a $50 rebate to each person who files income taxes. "I'm glad the money stays in South Carolina. Obviously, South Carolina will reap the benefits of that," House Ways and Means Chairman Murrell Smith, R-Sumter, told The Post and Courier. He added: "What we're hoping is that, through the taxpayer rebate, all taxpayers in this state will also benefit as a result."